On December 6th I officially became a member of the Land Economics Society LAI. I look forward to connecting and learning from this amazing group of thinkers & designers. A well spent 1.5 hours. Check out the dialogue. You can never have too many bathroom puns in a single hearing. It's always a good sign when the cartoonists make fun of your work. Fast Company: Can San Francisco’s new UFO toilets fix its hygiene problem? The new pods are called AmeniTrees. SmithGroupJJR designed them to be modular. Each pod will be built from a set of panels that can be rotated and repeated to create different shapes and sizes. There’s a smaller pod that acts as an information kiosk, and a the larger one that’s a toilet. We can only hope that people don’t confuse them. The pod’s aesthetic is futuristic–fitting for the city’s rampant technophilia–with a shiny glass and metal skin that can contain static or digital displays to use for in advertising and city information. According to SF Weekly, the new design closely matches the look of other new public infrastructure–the canopies for the stops of the Bay Area Rapid Transport system that connects San Francisco and Oakland with areas in Alameda, Contra Costa, and San Mateo counties. It’s a good narrative. Better than the one I imagined of launching pods paid by Silicon Valley bros to get rid of all the homeless people they hate. It’s yet to be seen if the new AmeniTrees are going to have any effect on the city’s hygiene problem. I can already imagine people using all that foliage as another public restroom (although perhaps seeing their own reflection on the pod’s mirror surface will shame them enough to instead do it inside?). San Francisco, CA – Public Works, in partnership with the JCDecaux street furniture company, has chosen the SmithGroupJJR architectural firm as the winner of an invitation-only competition to redesign San Francisco’s on-street public toilets and multi-function kiosks. “SmithGroupJJR’s design is forward-thinking, combining natural elements and environmental sustainability with modern technology and materials. This 21st-century street furniture reflects our San Francisco values, as we invest in a public realm designed with dignity, inclusivity and beauty,” said Public Works Director Mohammed Nuru. 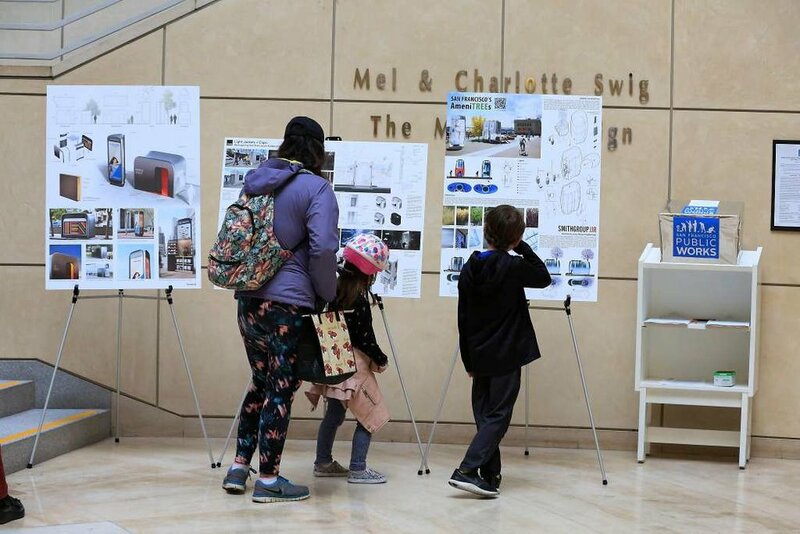 With three strong conceptual design proposals from local firms SmithGroupJJR, Min Design and Branch Creative making the final cut, Public Works solicited community input on this once-in-a-generation opportunity to reimagine and upgrade the public toilets and public service kiosks. The public input helped inform the final decision of the design competition jury members, who included City staff from Public Works, the San Francisco Arts Commission, the Historic Preservation Commission and the Port of San Francisco, and the following outside experts: Yakuh Askew, Y.A. Studio; Laura Crescimano, SiteLab Urban Studio; Joshua Aidlin, Aidlin Darling Design; Jon McNeal, Snøhetta; Maryam Rostami, TEF Design; and Nataly Gattegno, Future Cities Lab. The design of the new toilets and multi-function kiosks complements the contemporary and elegant designs of the soon-to-be completed BART portals on Market Street and the café kiosk at Civic Center Plaza at Larkin and Grove Streets. During the next few months, JCDecaux’s engineers will work closely with the project team from SmithGroupJJR to develop and refine the proposed design to meet operational needs and accessibility. The attached drawing is the preliminary concept, which will transform and develop through this process. As the toilets and kiosks are intended to be used for the next 20 years, they need to be not only timeless in their design but detailed, fabricated and maintained to withstand a generation of public use. Once the construction documents are close to completion – most likely mid-summer – the project will be presented at the San Francisco Arts Commission and Historic Preservation Commission hearings for consideration. Since 1995, San Francisco has benefited from a collaboration with JCDecaux in providing 25 accessible public toilets and 114 kiosks. These compact structures are spread throughout the City, though concentrated along Market Street, downtown and in popular tourist destinations. Like its predecessors now on San Francisco streets, the new model will be self-cleaning, accessible to people with disabilities and connected directly to City sewer, water and electrical lines. JCDecaux will cover the cost of the construction, installation and daily maintenance. The company also will fund staffing of the toilets at select locations under the City’s successful Pit Stop program. The advertising displayed on the public service kiosks, which in some locations will house such micro-retail establishments as newspaper stands and coffee vendors, also can display public messaging from City agencies about upcoming events, ongoing programs and other topical issues. The kiosks will offset JCDecaux’s costs for the toilets and the operating costs for the program. After putting the new public toilet contract out to bid, Public Works entered into exclusive contract negotiations with JCDecaux last year. The Board of Supervisors is expected to consider the proposed agreement in September. The current contract expires in October 2018. The 24/7 City agency cleans and resurfaces streets; plants and nurtures City-maintained street trees; designs, constructs and maintains City-owned facilities; inspects streets and sidewalks; builds curb ramps; eradicates graffiti; partners with neighborhoods; trains people for jobs; greens the right of way; and educates our communities. The company is one of the world’s preeminent integrated design firms. Working across a network of 12 offices in the U.S. and China, a team of 1,300 experts is committed to excellence in strategy, design and delivery. The firm’s San Francisco office has been in operation since 1927, helping to influence the City’s design aesthetic, including four recent building projects in Mission Bay. The new JCDecaux toilet and kiosk design is an opportunity to build on the firm’s deep understanding of San Francisco’s rich history and progressive future across the urban landscape. About JCDecaux (www.jcdecaux.com): JCDecaux, the number one outdoor advertising company worldwide, is present in more than 80 countries and 4,033 cities. For more than 50 years, JCDecaux products and services have been the benchmark in urban innovation, quality, aesthetics and functionality. A longstanding member of the San Francisco community, JCDecaux has operated street furniture programs at the service of the City since 1994. Bid adieu to the old, green JC Decaux public toilets, because our city infrastructure is finally catching up to our sleek, tech-centric aesthetic. Public Works announced Monday that it has chosen a winner for its invitation-only competition to redesign the city’s toilets and kiosks. More than 200 responses from the community were submitted through an online survey, and a slew of city organizations reviewed the entries. In the end, SmithGroupJJR is the winner. A rendering of a structure (that may be a kiosk or a toilet, it’s unclear) shows a multipurpose facility, with planters and benches lining the edges, and a living garden on the roof. It’s not a bad choice – the design closely matches the aesthetic of the new BART canopies, some of which are already under construction. And, the new toilet designs are way better than some of the other proposed options, which embraced an old-fashioned Brutalist aesthetic. Public Works Director Mohammed Nuru praised the design.“SmithGroupJJR’s design is forward-thinking, combining natural elements and environmental sustainability with modern technology and materials. This 21st-century street furniture reflects our San Francisco values, as we invest in a public realm designed with dignity, inclusivity, and beauty,” he said. As for when they’ll be released? Don’t hold your breath. JCDecaux engineers will work closely with SmithGroupJJR over the next few months to refine the design to better accommodate operations and accessibility – which does imply that the aesthetic may still change a little. Once that process is complete, the project will be presented to the San Francisco Arts Commission and Historic Preservation Committee for their review. Hopefully, that extra care and attention mean we’ll get something long-lasting, as the expectation from the city is that these new facilities will be used for the next 20 years. In a city that can barely keep its escalators running, expecting toilets to remain visually attractive and functional is a lofty aspiration, but we wish them luck. It’s take two for San Francisco’s public toilets 2.0, with a proposed design that would replace the current mock-Parisian models with bulbous metallic orbs that could be topped by plants or shrubs. The concept is a sleek, shiny counterpart to the forest-green art nouveaux toilets that have been on city streets since the mid-1980s. But the conceptual design announced Monday by the Department of Public Works also is a change from the boxy, gray modern look that went through several rounds of public review last year. “We went back to the drawing board” after the proposed update got ran into criticism, said Mohammed Nuru, director of Public Works. This included a tepid reaction from the Historic Preservation Commission — not because the modern makeover was too modern, but because it had all the finesse of a utility box. The department responded by holding a private competition where 12 local architecture firms were asked to submit design schemes. A jury that included bureaucrats and practitioners whittled down the entries to three finalists. After another round of design submissions, the jury selected the San Francisco office of SmithGroupJJR. The winning concept consists of a simple but adaptable tube with curved walls of reflective metal and a flat top that could hold plants, shrubs — theoretically even a tree. Ideally, the concept also “tells a story of sustainability and conservation” by recycling the water used to wash your hands — perhaps by irrigating the plants up high. While the emphasis on clean 21st century design captured the imagination of the design jury, the makeover ultimately must be approved by the Board of Supervisors. Along the way there’s sure to be scrutiny from design watchdogs who are happy with the traditional-looking kiosks and loos installed back in the 1980s, when contemporary architecture was out of vogue. “Pity we lean toward ‘modern,’ which has a shelf life, as opposed to classic, which is timeless,” Darcy Brown, executive director of San Francisco Beautiful, said yesterday. Her group was an opponent of last fall’s design. The most important gauges of a public toilet’s success, of course, are whether they are used by the public and whether they work from one day to the next. SmithGroupJJR will now work with the company that installs the toilets, JCDecaux, to adapt the winning scheme to the realities of construction and maintenance. 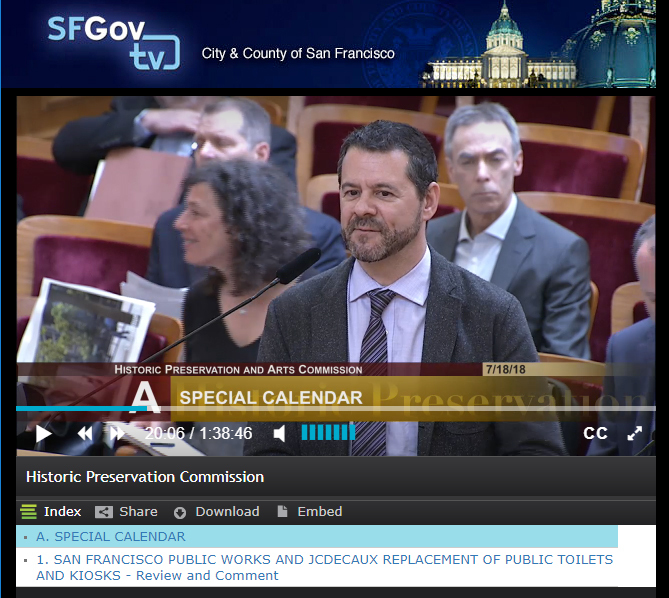 The goal is to do this fairly rapidly, so that a full set of designs and renderings can be presented this summer to a joint hearing of the San Francisco Arts Commission and the Historic Preservation Commission. This will also include designs for the advertising kiosks that Decaux is allowed to operate in order to raise money to install and maintain the toilets. At present there are 28 public toilets and 114 kiosks in the program, most of them in downtown neighborhoods. John King is The San Francisco Chronicle’s urban design critic. UC DAVIS-COURTESYTraditional urban planning favors “concentric” layouts with a downtown core surrounded by suburbs and farmland (right). But Catherine Brinkley argues instead that cities should plan for “rugosity” (left) with more interfaces between functions. San Francisco, CA – Public Works, in partnership with the JCDecaux outdoor furniture company, is embarking on a once-in-a-generation replacement of San Francisco’s on-street public toilets and multi-function kiosks. After an invitation-only design competition among San Francisco architects and industrial designers, three finalists have been chosen. “The trio of conceptual designs will be on display for community input on how San Francisco can re-envision these public amenities to meet the functional needs and aesthetics of our 21st-century iconic city,” said Public Works Director Mohammed Nuru. The design competition jury is pleased to announce that the following three firms are the finalists: SmithGroupJJR, Min Design and Branch Creative. San Francisco Public Toilet & Kiosk Competition Designs Revealed! This morning our design was announced to San Francisco and beyond! Our team at SmithGroupJJR is thrilled to be one of three finalists in the city competition focused on replacing all of San Francisco's on-street public toilets and multi-functional kiosks. Check out all three designs at https://sfpublicworks.wixsite.com/designcompetition. Our solution is titled San Francisco AmeniTREES. Our goal was to create a sculptural solution that merges nature and technology. If you feel inspired, please leave supportive feedback on our submission! Science on display in the details on the a recent project. Twenty students and three faculty members from Kennedy High School in Richmond spent the morning of April 26 looking, listening and learning about the breadth of computing at Berkeley Lab, from desktop machines to supercomputers. The students are enrolled in the high school’s IT Academy, which includes classes on computer design, networking and web design, and integrates those subjects with classes in English, history and science. Jaime was also impressed by the seismic flooring under the machine room and surprised by the sticky floor mats used to keep dirt from being tracked into the machine room. In addition to the tour, the group heard an overview of the lab and the role of computing and networking in supporting science by Computing Sciences Deputy Jonathan Carter and heard a short presentation by Jose Sierra, a graduate of the IT Academy who now works in the Computing Sciences desktop support group. Sierra urged the students to take advantage of opportunities like the visit to learn more and meet people who may be able to help them in the future. SmithGroupJJR convened at Lawrence Berkeley National Laboratory’s campus to conduct its annual Science & Technology client advisory think tank. LAB2050: The Physical Manifestation builds on the original LAB2050, which was a year-long research initiative to dig deep into scientific trends, technologies and economics that will shape research environment design. This next iteration of LAB2050: The Physical Manifestation asks different questions: What does the future research environment look like? How will it function? Where will it be? How can we prepare now to achieve this future state? Joined by some of the brightest scientific minds from places such as NASA, Stanford and BioGen, the LAB2050: Physical Manifestation design charrette investigated three scales—spatial, building and campus. I was recently part of a panel discussion at SmithGroupJJR’s Design Perspectives series titled “Is Campus Context More than Skin Deep?”, where we delved into the issues surrounding the definition of a campus and the attributes that support academic, corporate, and technology environments. My original suggested title, “Context, Schmontext”, didn’t fly, but it did reveal my clear bias on the subject. The notion that campus buildings need to have an aesthetic similar to the popular 1970s children’s clothing line, Garanimals, where everything matches with interchangeable tops and bottoms, has led to some interestingly written design guidelines. There is something nostalgic about walking through a campus like the University of Virginia. However, when you take a look at the more recent additions on campuses with a “protected” aesthetic, one can clearly see where the control of the campus guidelines has led the architect astray. Don’t get me wrong, I do believe that buildings must respond to their context whether they are part of a campus, complex, or neighborhood. I also believe that buildings should look like they were built during their time of construction and reveal the program happening within. Discussions on context tend to always lead to the notion of timeless design. Yes, every pitch we do as architects as well as a client’s stated goals, include the idea of a timeless design, but someone needs to state the obvious – there is no guarantee that the provided design will be timeless. This is one of the exciting parts of the architectural environment. Every building, good or bad, represents an artifact from the time it was conceived and constructed. We can hope that time will be kind to our designs in the long run. In a day when great mid-century buildings are threatened across the country, we need to pause and really think about how a building represents an important moment in our architectural history as well as how it supports the idea of a campus beyond superficial aesthetic. Just watch what is happening to William Pereira’s campus vision at University of California, Irvine. Instead of preserving the original brutal concrete sculptural buildings that create a cohesive campus vision, the university has allowed these buildings to be stripped and refaced with forgettable facades. 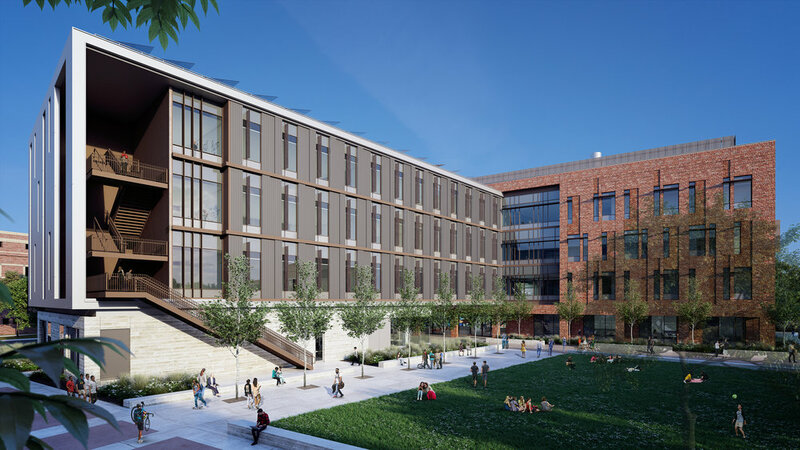 Ultimately, a campus is defined by much more than bookmatched buildings—whether or not the base campus aesthetic is defined by its dormer windows on tile roofs or by brutal concrete brise-soleil fins. Once a campus has enough of the defining character, should we consider throwing out the guidelines and see what happens? Bill Katz, AIA, LEED AP BD+C, is a Design Principal at SmithGroupJJR’s San Francisco office. He focuses on the Higher Education and Science & Technology markets. Kiosk Design Wins Design Award from the California Preservation Foundation! Very proud of this important civic infill project. I designed the kiosks at Perkins + Will. Project was documented and completed by TEF.